Show Notes from Podcast Episode Seven - All About the Boat. This episode is all about the boat. Hopefully I answer some questions about why, and how and what. There is a little bit of quilting sprinkled through the podcast and some listener/commenter feedback, but mainly it's boat, boat, boat. Don't say you weren't warned! Click here for Episode Seven at Podbean. Here is The Slightly Mad Quilt Lady at iTunes. Hope you enjoy it! Please leave me feedback and comments and any questions here - I really appreciate them. Well, you guys voted and so I took on the challenge. 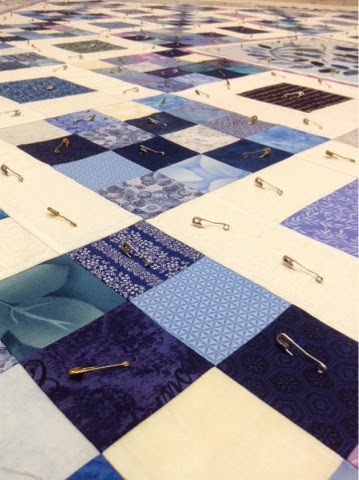 The giant blue and white quilt is basted, my knees are busted and I've pretty much worked out how I'm going to tackle the quilting designs. And now I need a cup of tea. The boat tour. Welcome aboard! Warning - this is a picture heavy post. Lots of people are pestering me for more pictures of our new home. And I am nothing if not obliging! 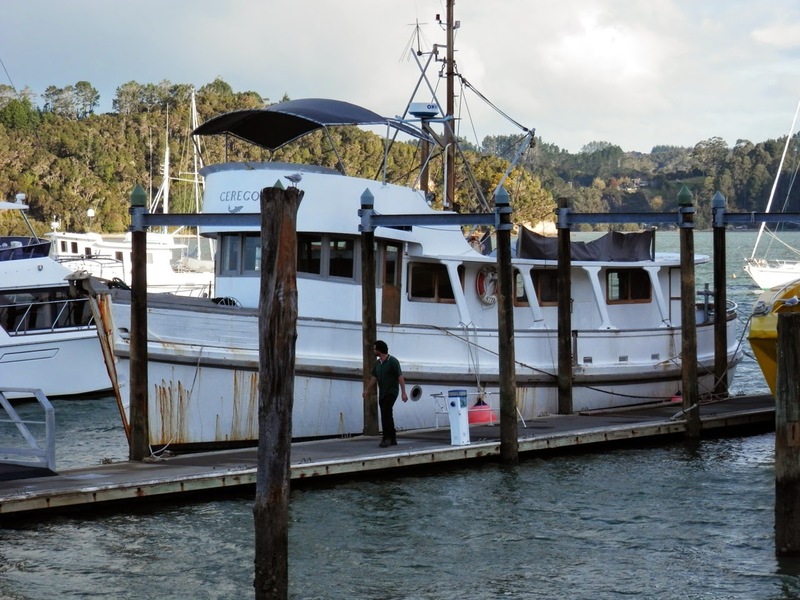 The picture above is Cerego berthed at the boatyard dock. That's my husband beside her, so you can get an idea of scale. 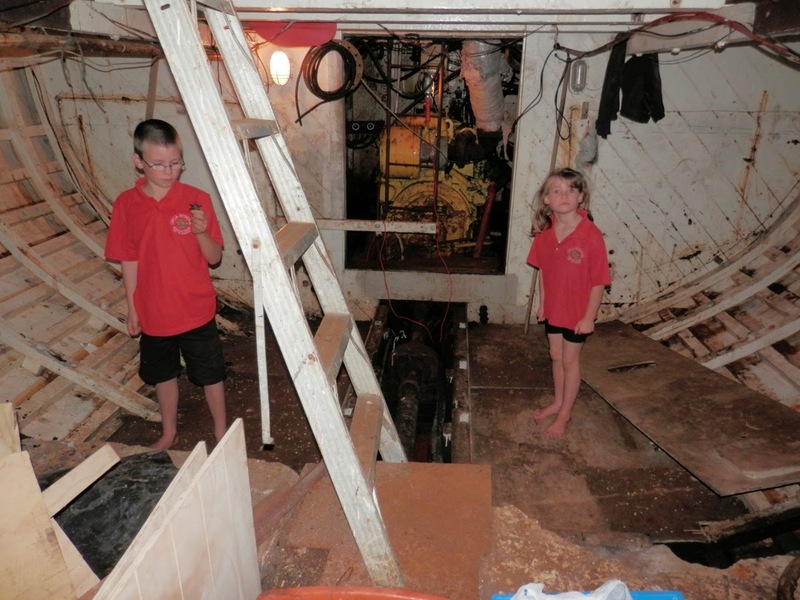 She is a wooden boat, built in 1943 for the Australian Navy and was meant to be used as a mine sweeper. She is 20.1 metres long, which is about 66 feet. The rust is not from her structural bolts - don't worry! down to a storage type locker. Large, dark and dingy. 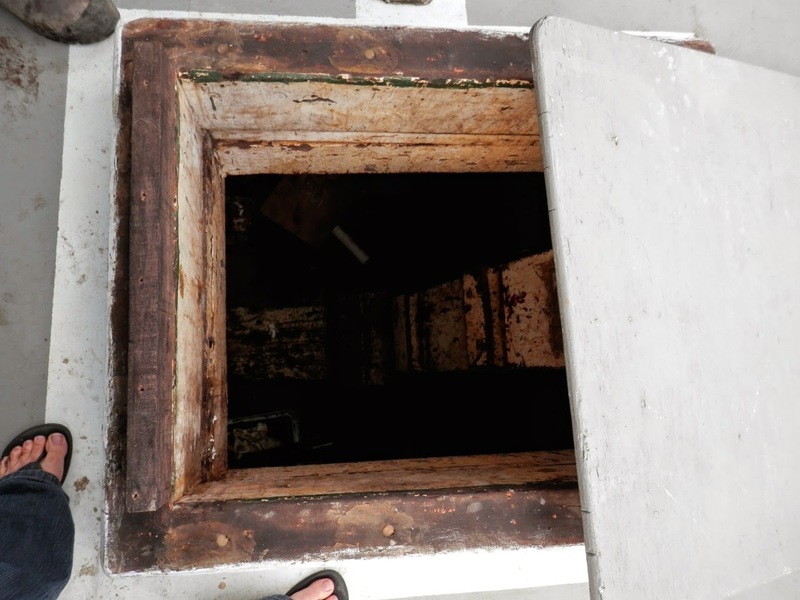 It has water storage barrels and other junk in it at present. 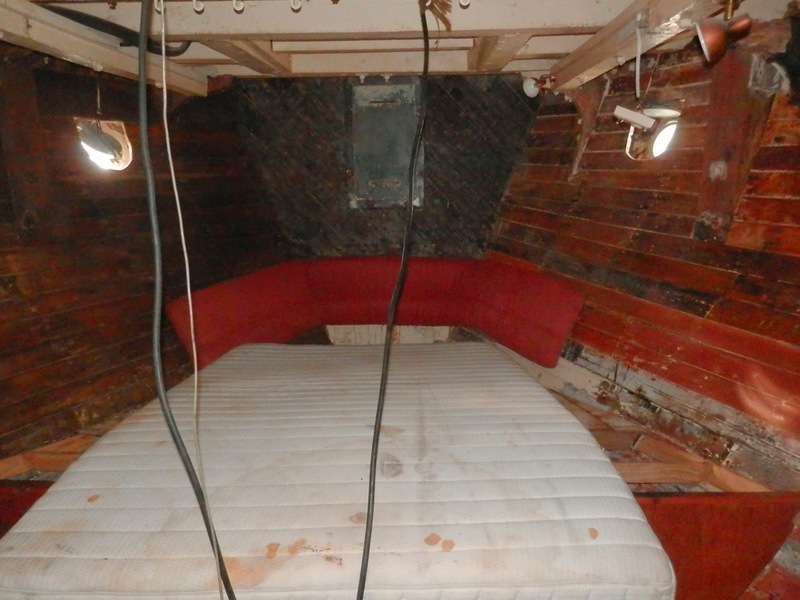 When you walk in through the back door, you see the main cabin, which is in the picture above and below. Above, in the corner with the rubbish bag, is probably where my sewing table will be set up. 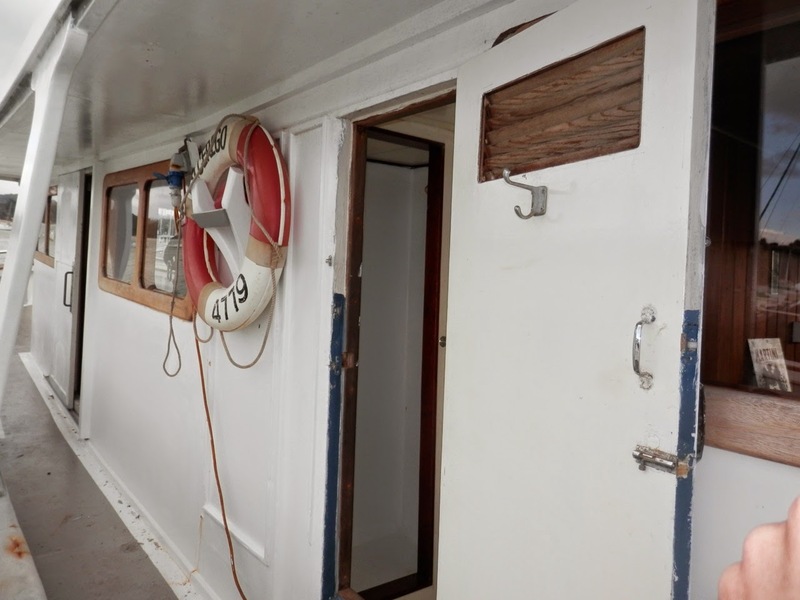 You can see the doorway that leads forward to the galley and wheelhouse. 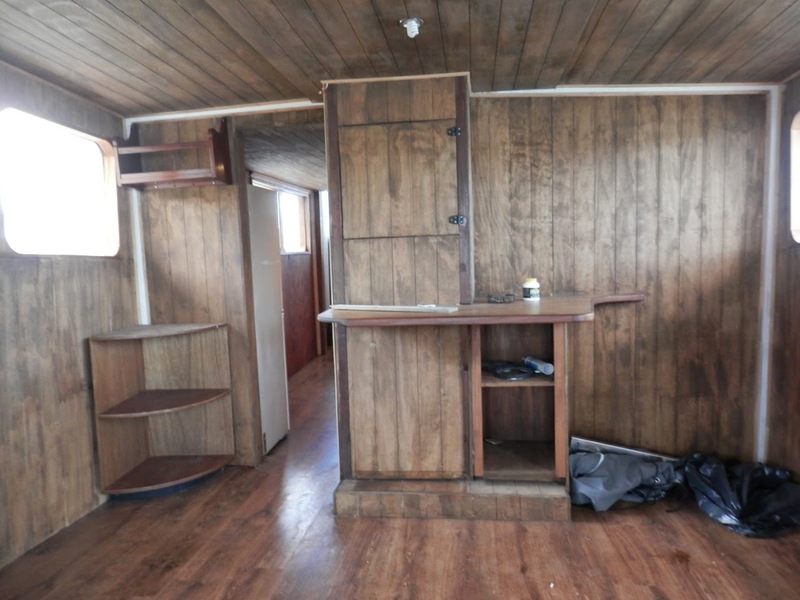 the yucky and really rough cabin that will be bunk rooms and play room for the kids. 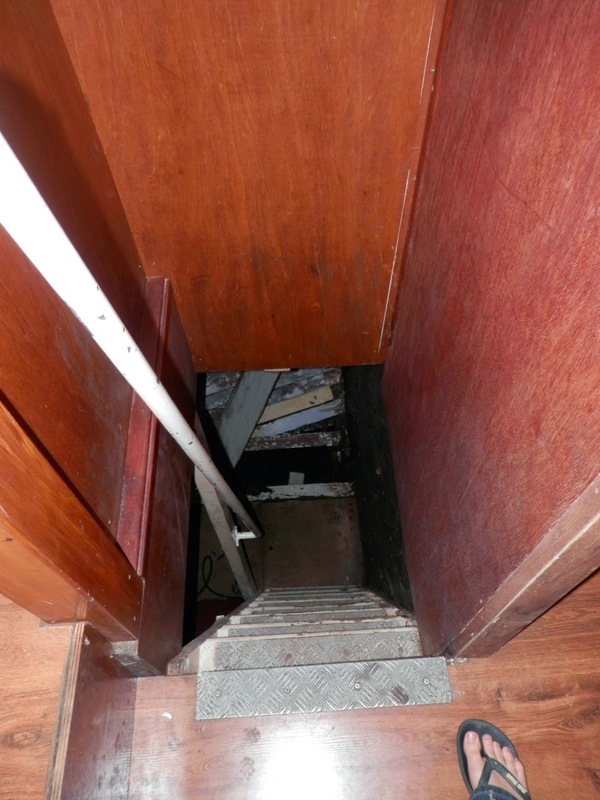 At the front of this cabin is the door leading to the engine room, you can see that below. 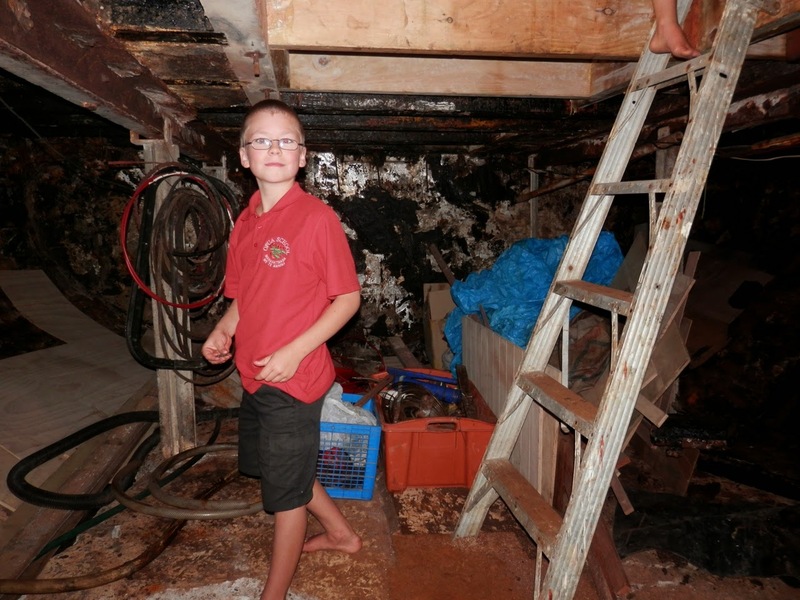 The areas below decks are where the work really needs to be done. 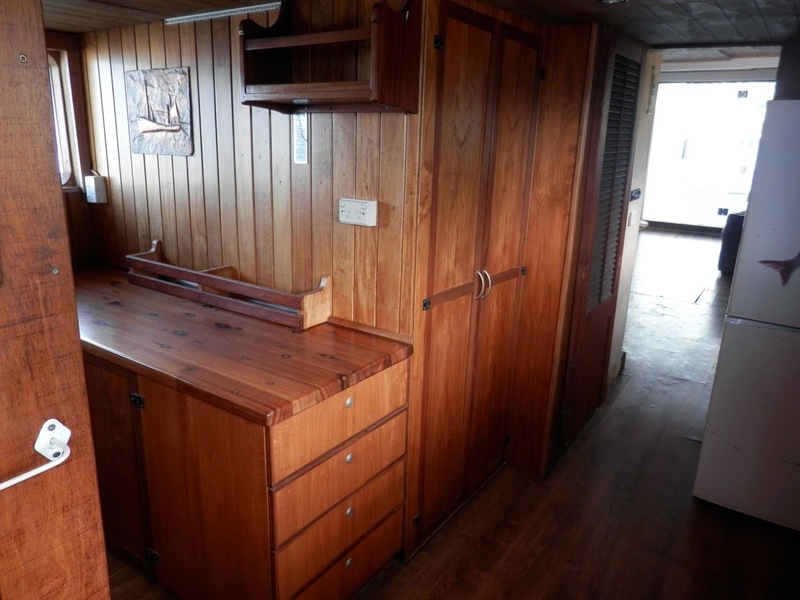 Panelling and painting and walls and bunks and portholes and light prisms. So come back up out of the kid's room into the main cabin and walk forward to the galley. This is the nice part of the boat. There is a microwave, electric oven, gas hob, decent sized fridge-freezer and, best of all, a good-sized pantry. 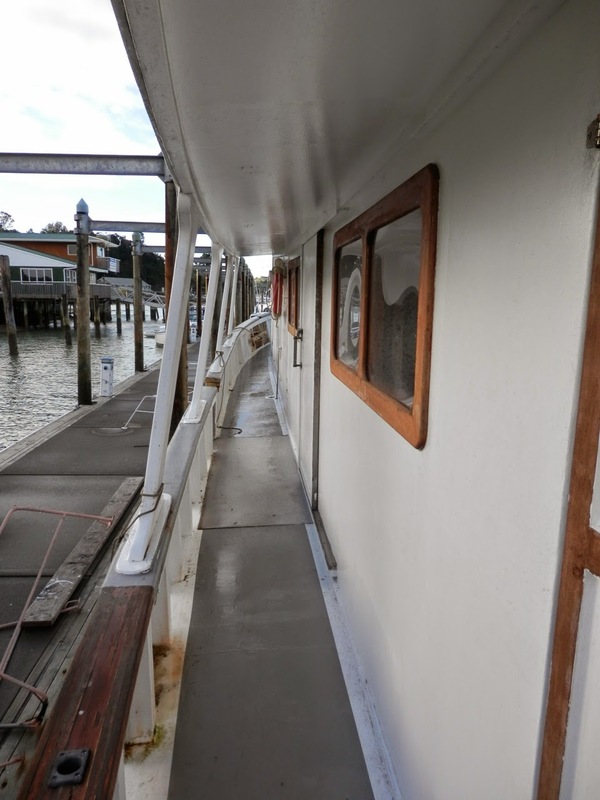 The photo below is looking back toward the main cabin. 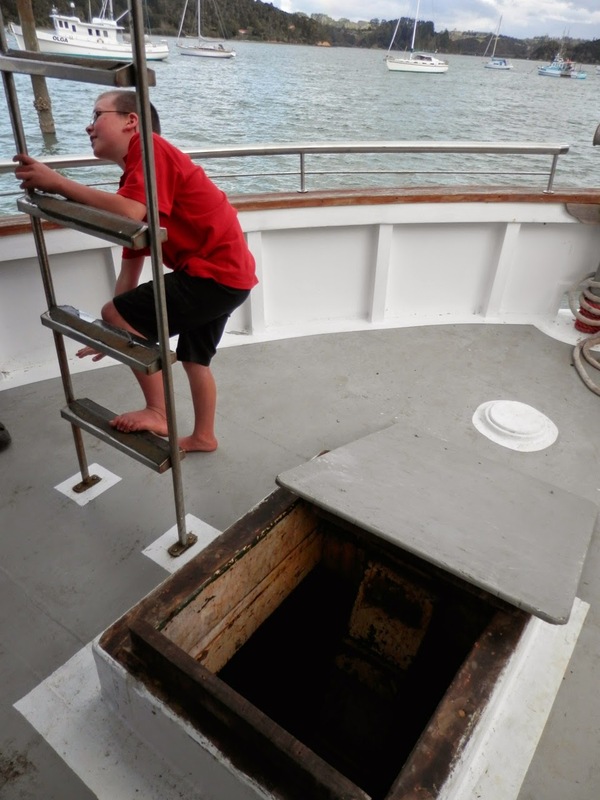 Carrying on forward toward the wheelhouse, you pass a little narrow (and steep) staircase. If you head down this staircase (almost a ladder really) you get to the forward cabin. Another area that needs major work. This icky looking bunk will go and be rebuilt in a more efficient way. Lots of painting etc again. 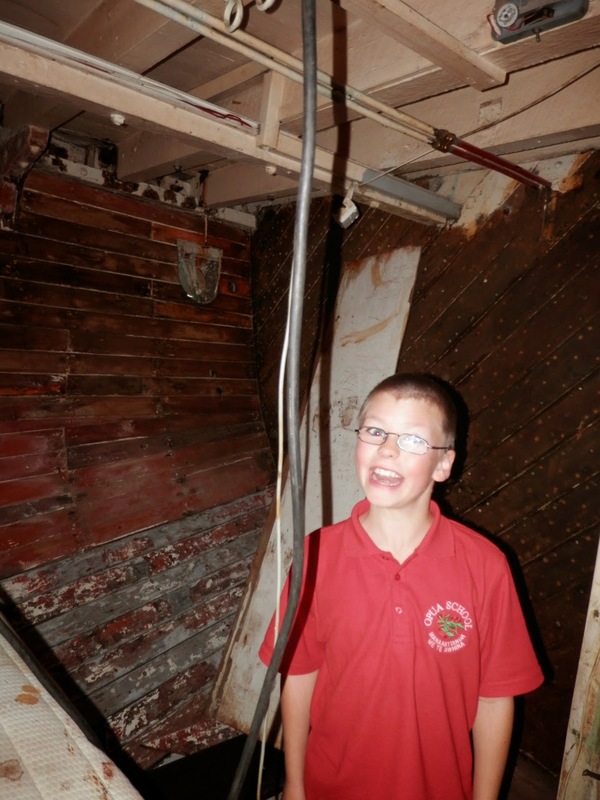 If you turn around, the photo above shows what the back of the cabin looks like - usually without the silly lad making faces! 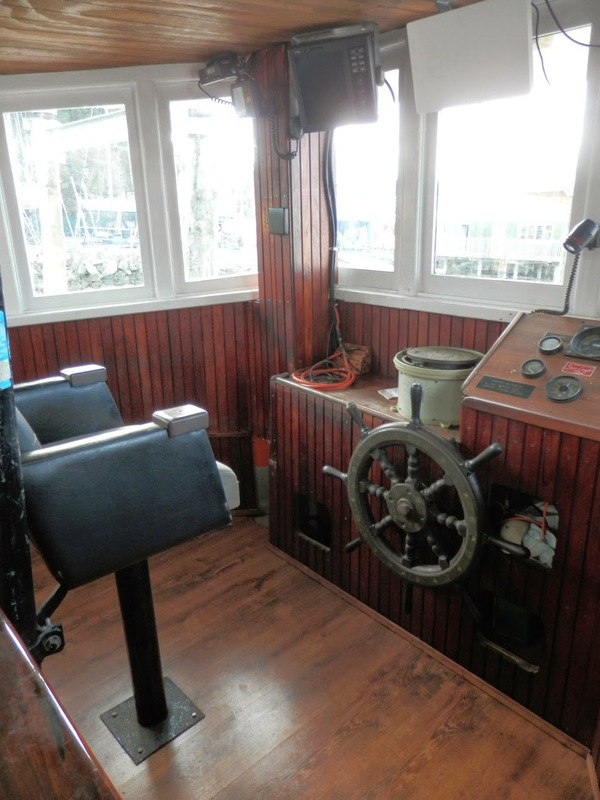 Above is the wheelhouse. It all looks 'proper' up here, like what you expect a boat to look like. What a about a bathroom? No, we don't have to hose off with saltwater! 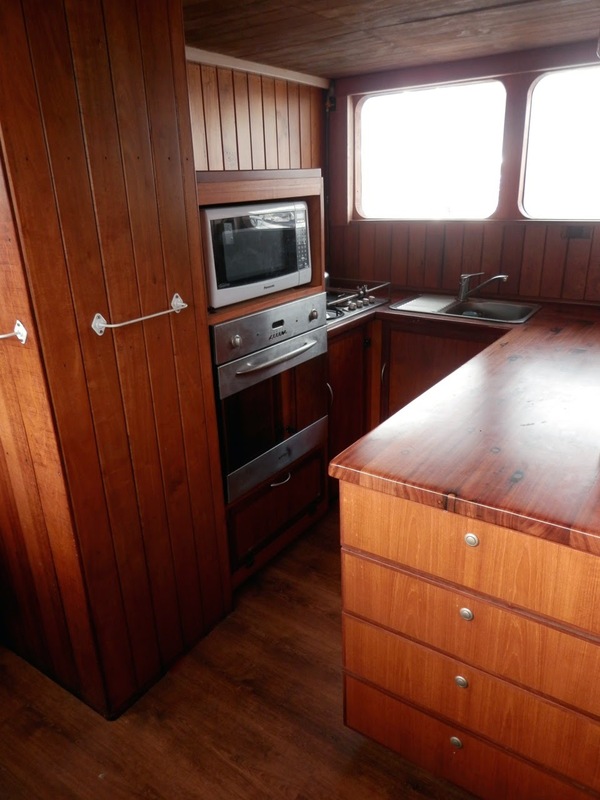 Down the other side of the boat (starboard) is a little cupboard cabin. Internally this sits between the galley and the main cabin. And inside this little cabin is an almost full sized shower and toilet. Yay! 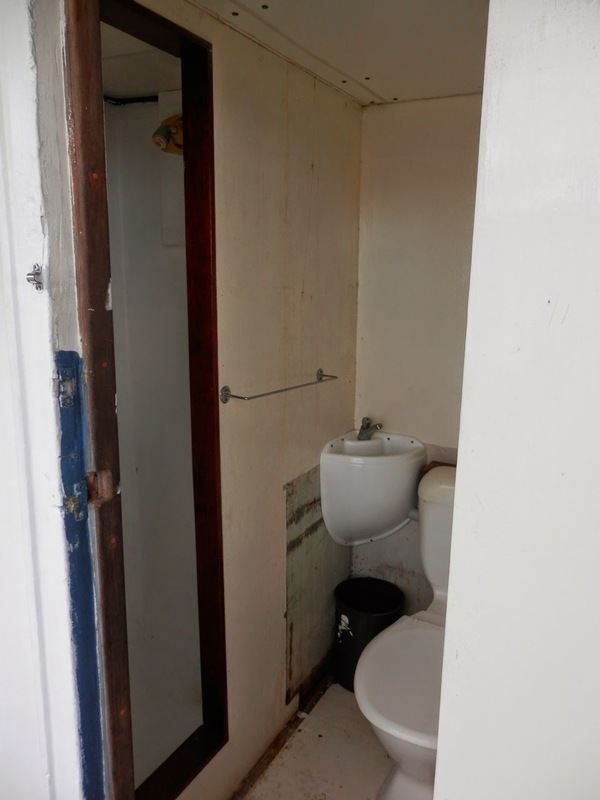 If you've ever used a standard boat toilet, you'll know why this is big deal. Back out onto the back deck, now head up that ladder. And you reach the top deck. The photo above is looking back toward the ladder. This will eventually have a handrail around the sides, and Hubby has plans to put the spa pool up here.....yes, I said spa pool! We have a little plug in portable one that he thinks we need. I'm not so sure. 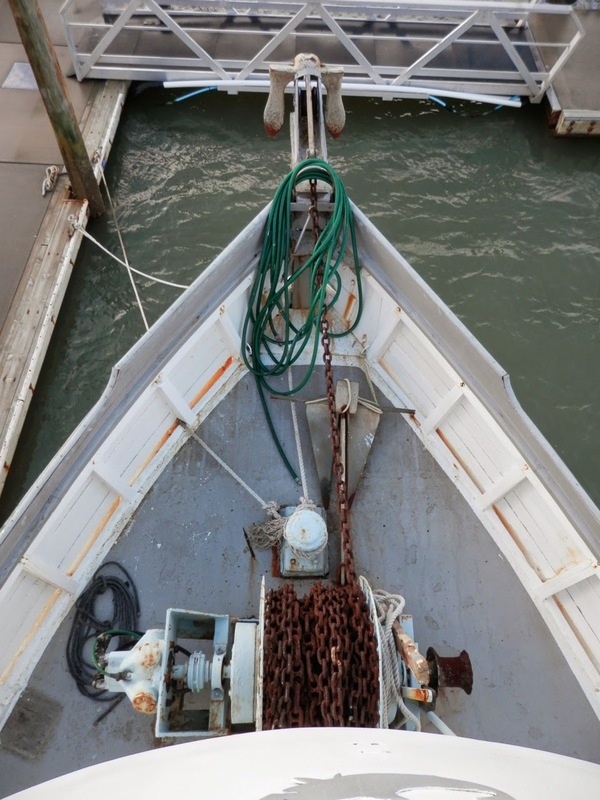 Right at the front of the top deck, you look over and down and you get a grand view of the anchor chains and winch. 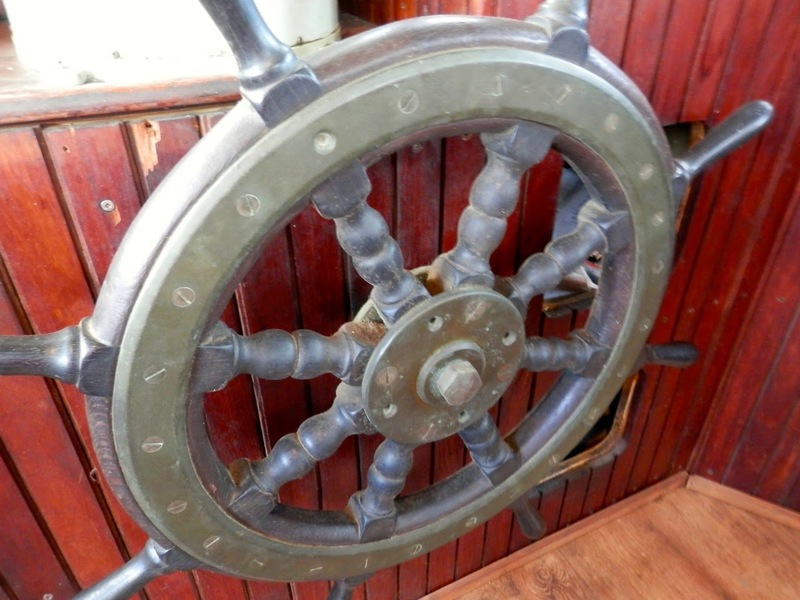 You're standing on top of the wheelhouse. So, I hope you enjoyed the tour. I'll write more soon about why we are embarking on this adventure. Where will I put the pets? Today, if all goes well, and I see no reason it shouldn't, we become the owners of a boat. A pretty big boat, but not as big as my house. And that is significant, because the plan is that we move onto this boat and live on it for a while. WHAT?! When did this all happen?! 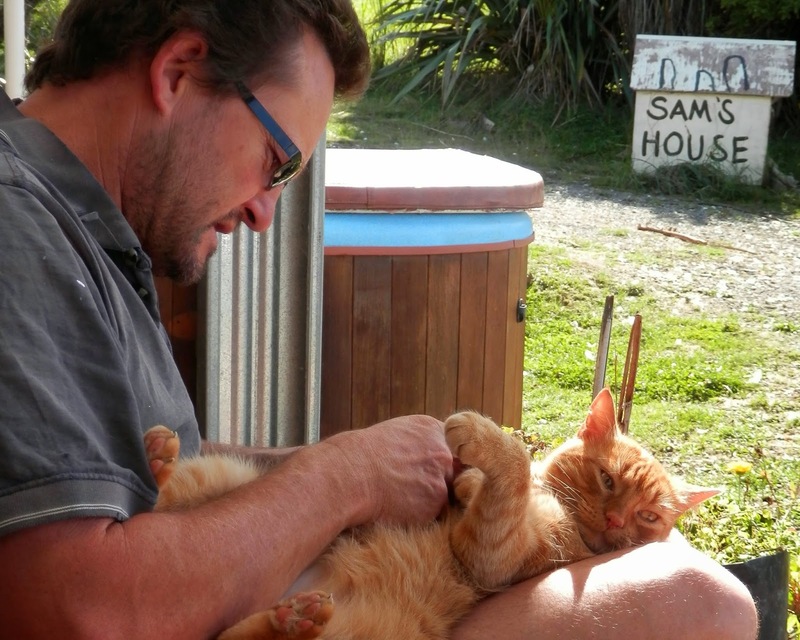 Well, I'm going to write more about this, but one of our first considerations was where do we put the pets? 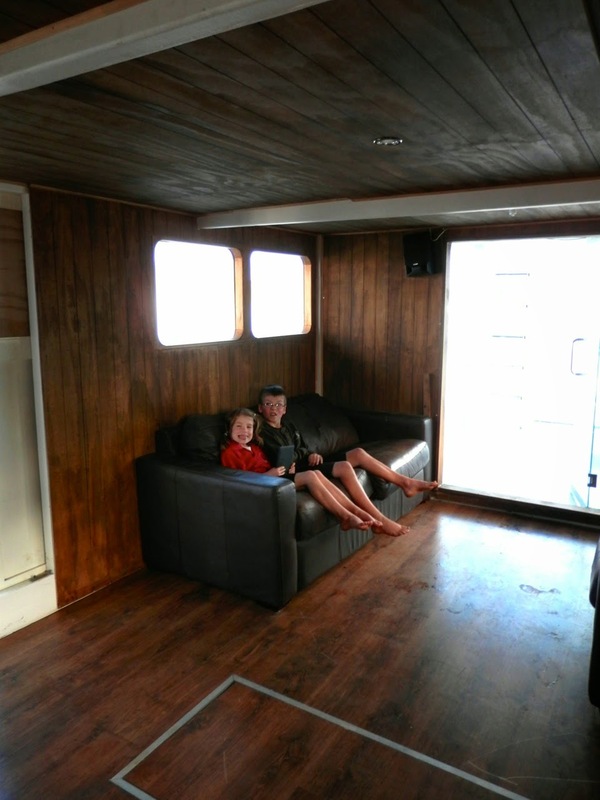 Part of what decided us to buy the boat was the availability of a cheap berth in a convenient location. We have two dogs. Sam is very old and sits on her mat all day, but Emma is younger, dopey and super enthusiastic. 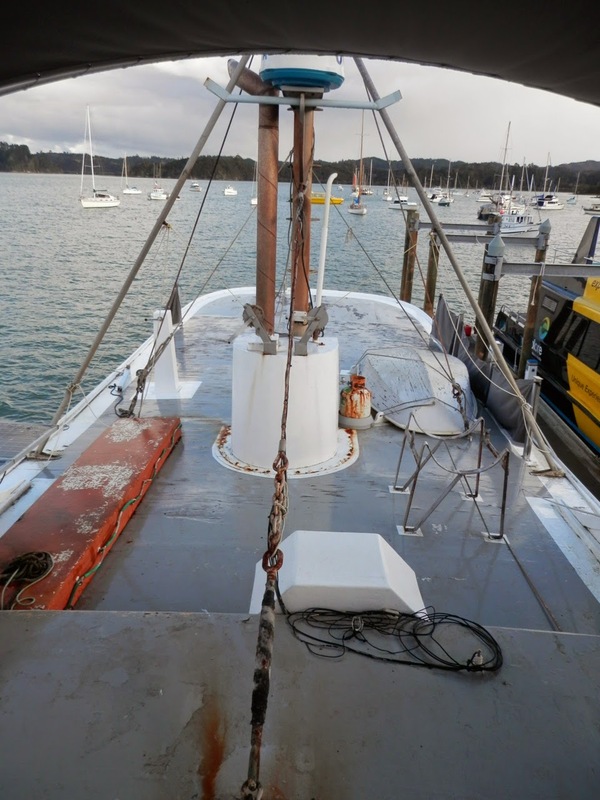 We won't be moored out in the water, so we will be able to step off the side and walk the dogs easily, and Emma will probably go to work with my husband every day. His work will be a very short bike ride down the road. 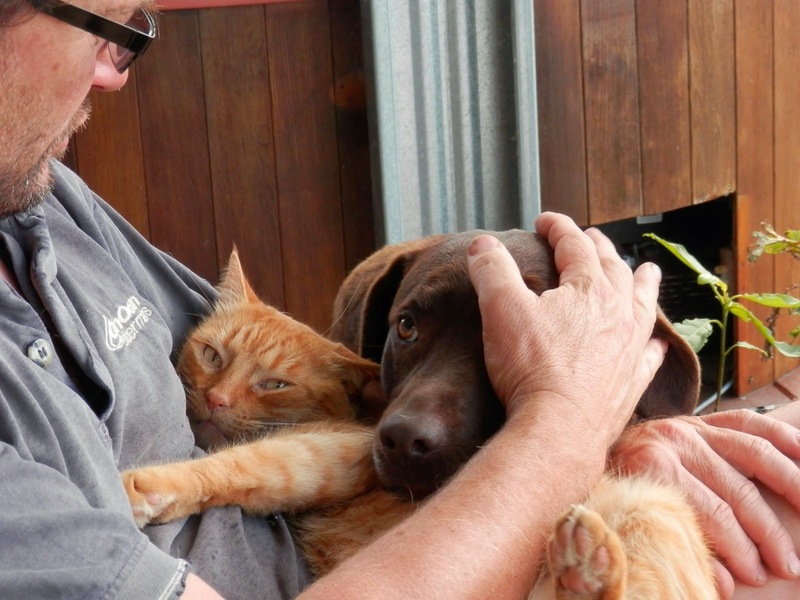 So it may take some adjustment, but I think we will manage with the dogs. We do have options of placing them with friends, but that wouldn't be our first choice. I think the the cat will transition easily, it will just mean a litterbox. And hopefully he'll keep the seagulls off the roof! The chickens, ducks, sheep and cows will either have to find new homes (some of them were planned for the freezer shortly anyway) or we will 'gift' them to our tenants. That's another thing we have to do, find tenants for our lifestyle block. 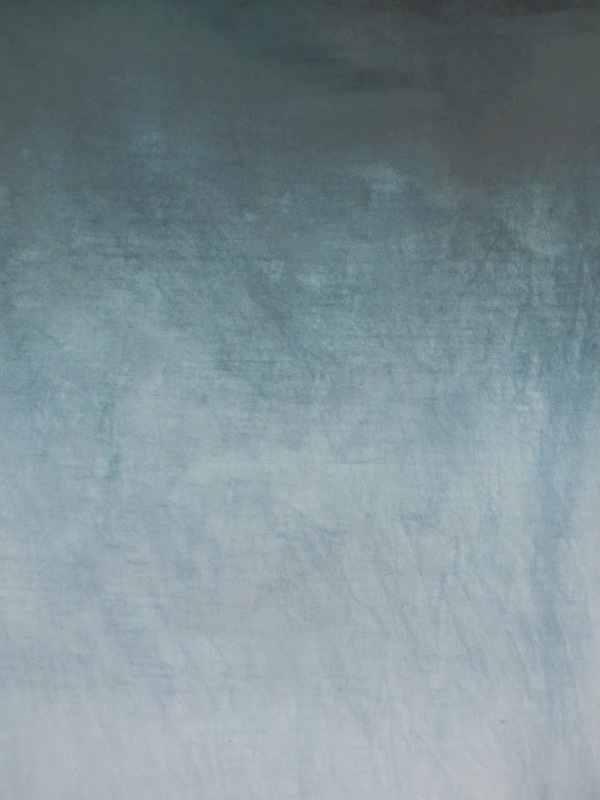 Oh man, the list of to-dos is huge! I will try and post pictures of my new abode soon. I've been sewing a few zippered pouches up out of bits and pieces. They are so quick and easy. I remember when I was intimidated by zippers, but they're really not that scary. 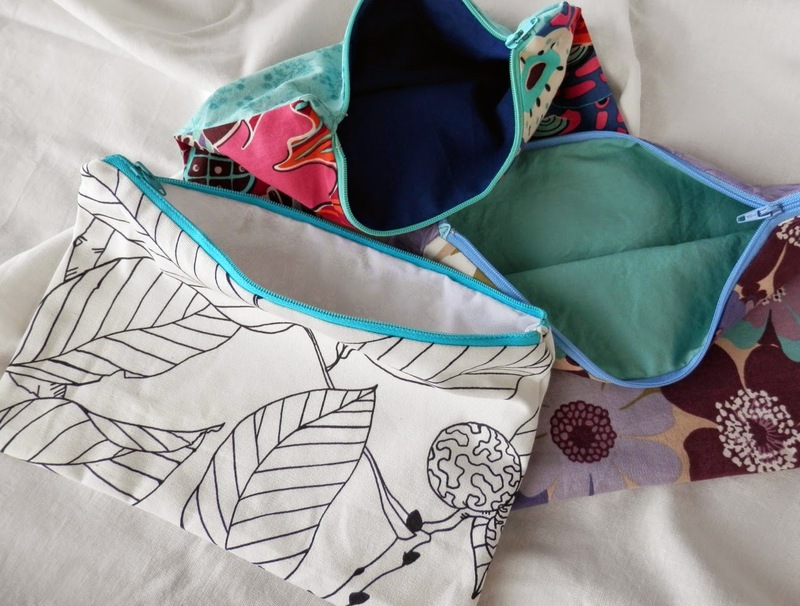 And the pouch tutorial that I follow has tabs on the end of the zip so it is perfect for beginners - not too tricky. 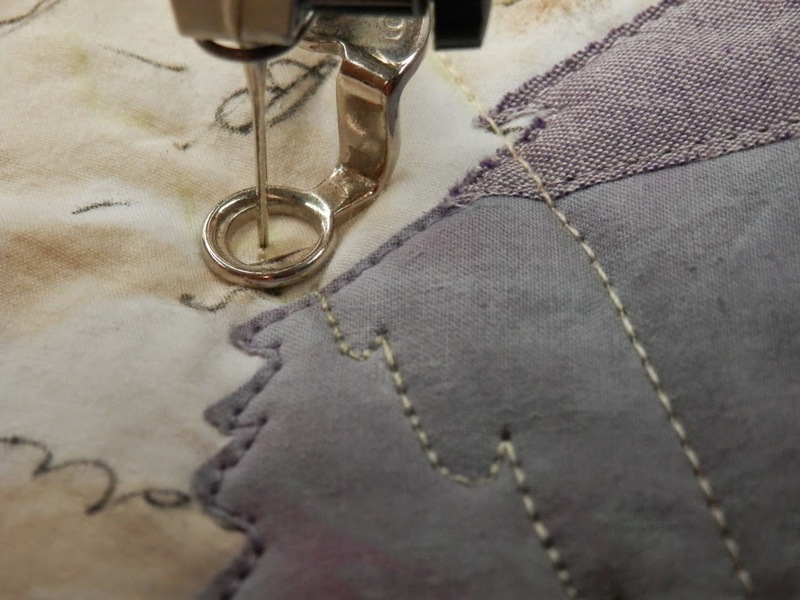 They are lined, so there is a tiny bit of hand sewing on the lining to finish them off, but that only takes seconds. 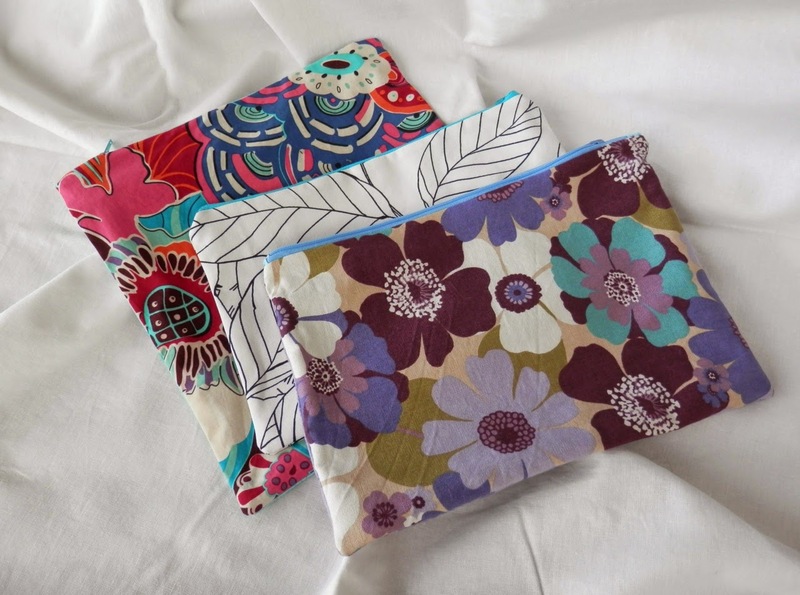 The fabric pieces aren't big so it can use up scraps and I often pick up perfectly good zippers at op shops, so these pouches can be a frugal make too. 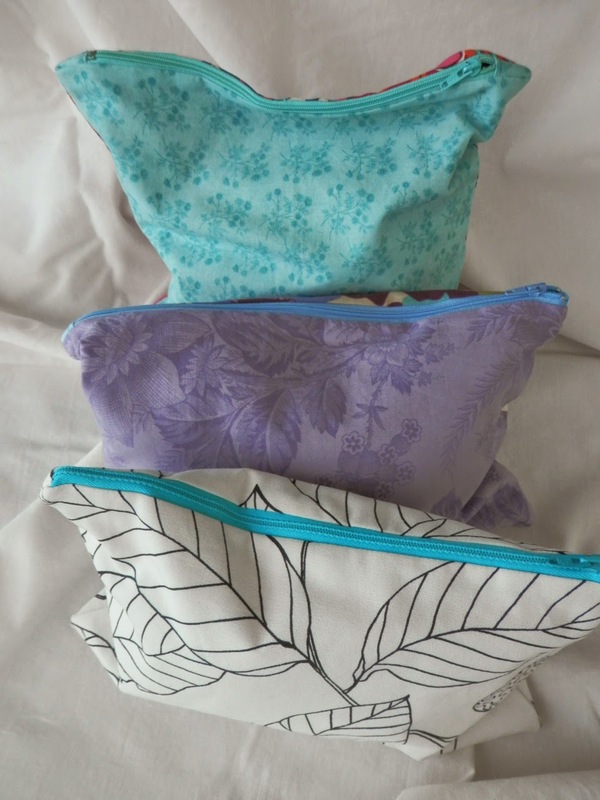 There are a million different zipper pouch tutorials out there. Just google it and pick whichever one takes your fancy. 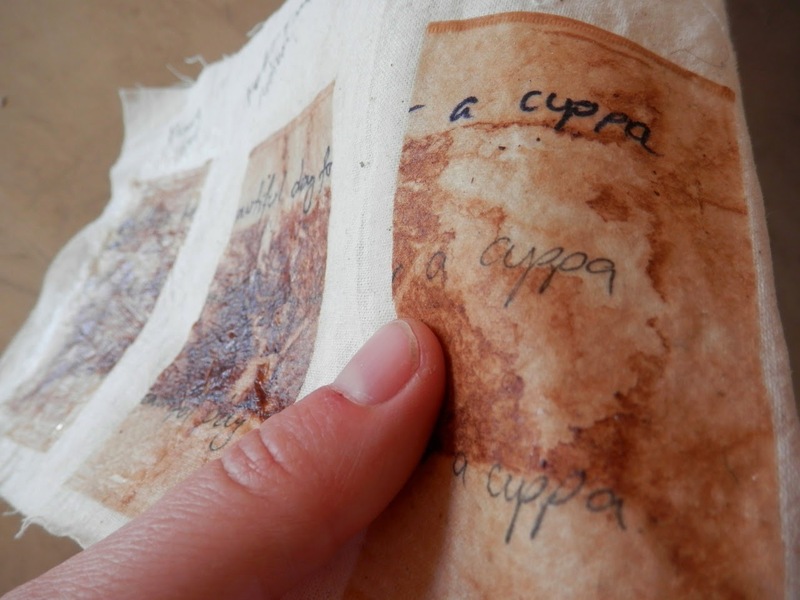 Seriously, they are easy, satisfying, use up scraps and make great gifts - give one a go today! 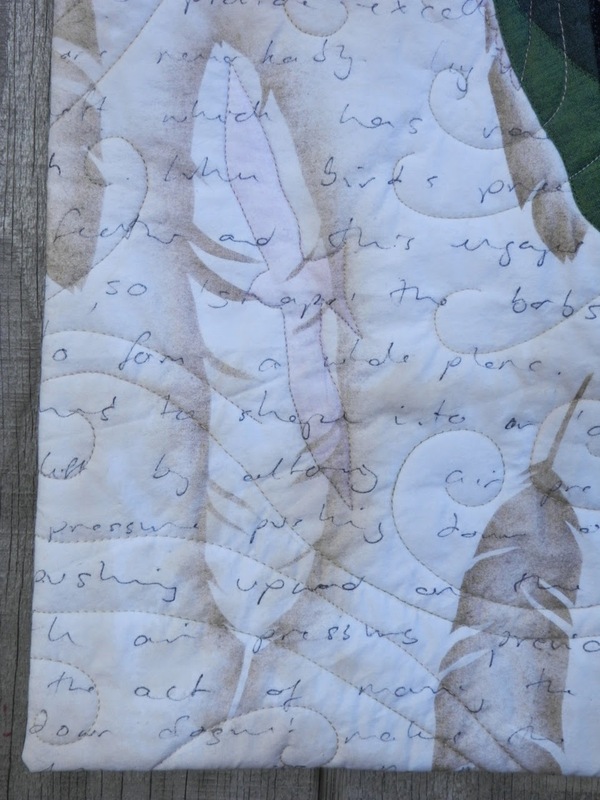 Shownotes for Episode 6 of The Slightly Mad Quilt Lady Podcast. 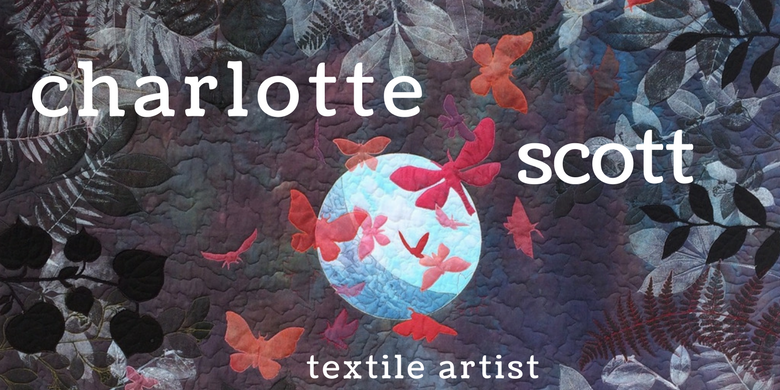 In this episode I goof up and tell you it's Episode 5, give you an update on myself, what I've been working on quiltywise, a book review, and a short synopsis of the history of quilting in New Zealand. The photos below are of my ombre hand dyes. The first set are of the two navy pieces. 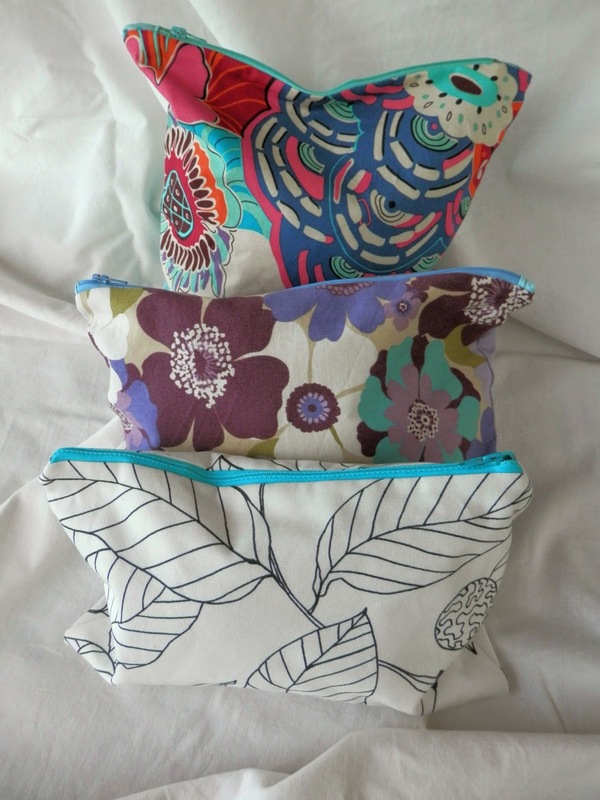 The fabric on the left is PFD Kaufman Kona Cotton. The fabric on the right is PFD P & B Muslin. 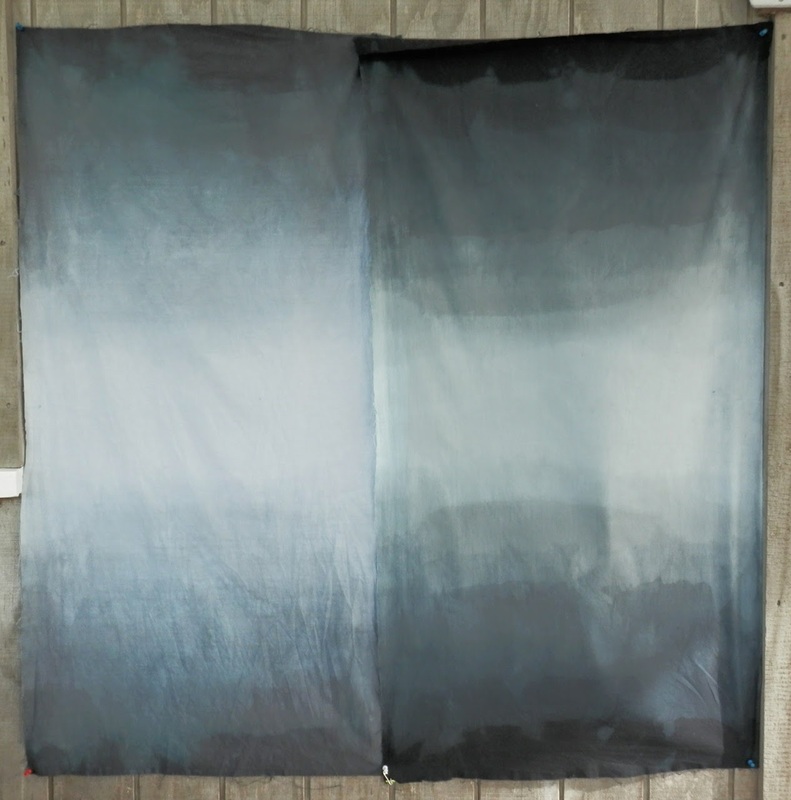 And the fabrics were layered together and dyed in exactly the same process at exactly the same time. There isn't much difference, although the Kona is slightly darker overall with a very slight yellower overtone. 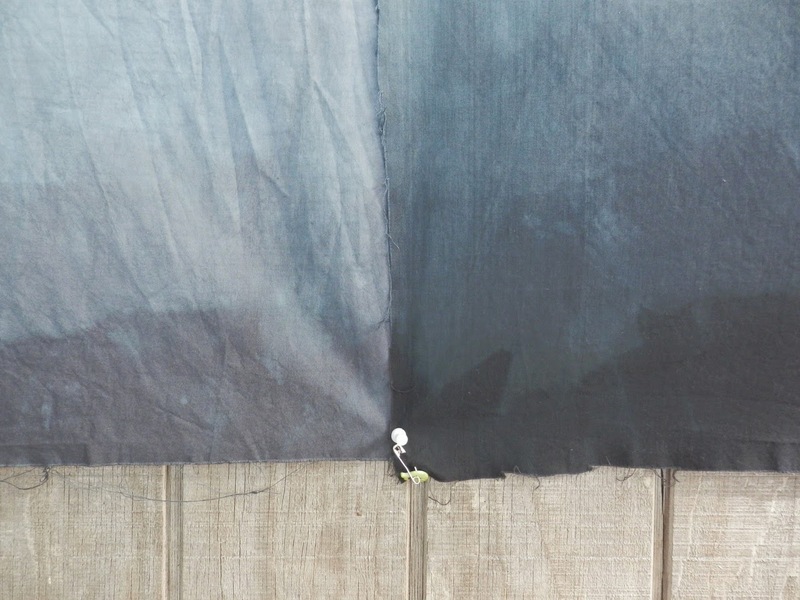 The next photos are of the warm black dye. The fabric on the left is the General Products Cotton Sheeting that I often use because it takes paint really nicely. But it's interesting to note how lighter in colour it is from the fabric on the right, which is PFD Kaufman Patina Cotton Poplin. 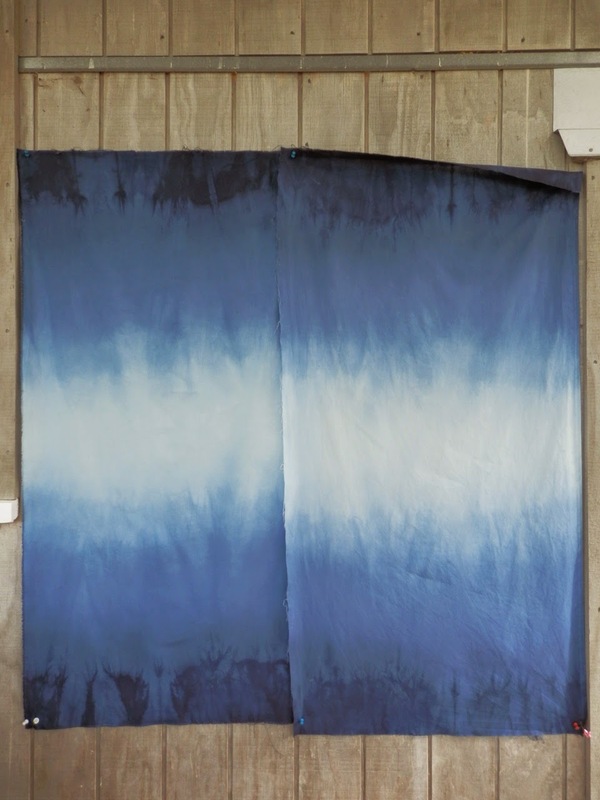 However, the poplin is very light weight and it sucked up that dye so fast it's given it horizontal striations. 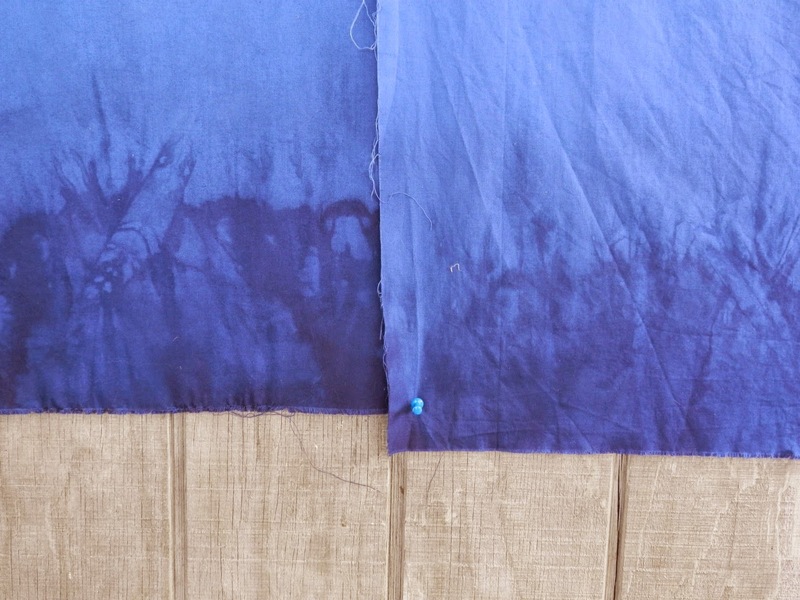 Again, both fabrics were layered together and dyed at exactly the same time with the same process. Ok, selfie time. 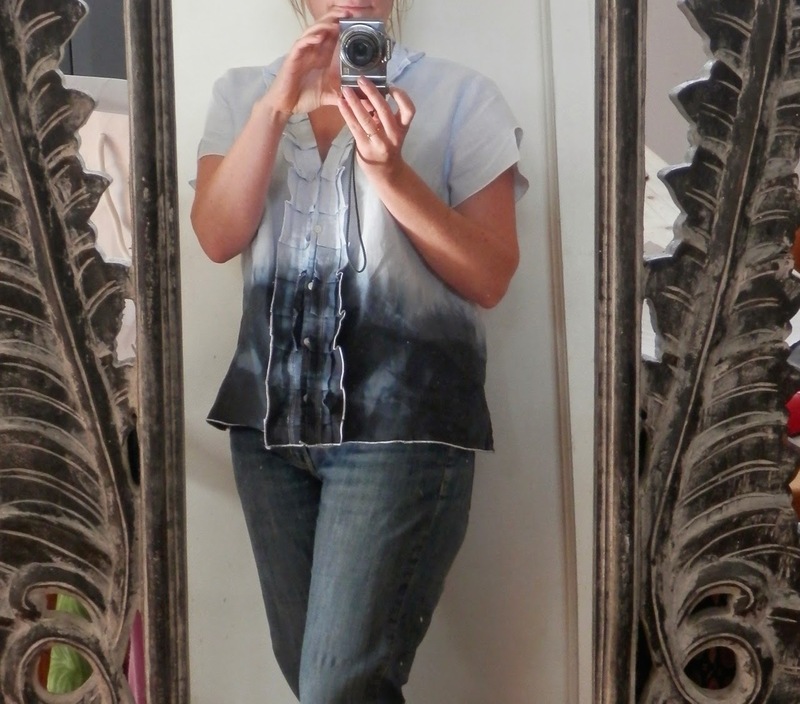 Here is the linen blouse I was talking about. As soon as I put it on I realised that my plan to perhaps wear it belted is not happening because that will cover the wicking line. My kids took this one of the back for me. I was hamming it up as daughter was getting annoyed that I wasn't doing the proper 'model' poses. Ug, she watches too many girlie cartoons. 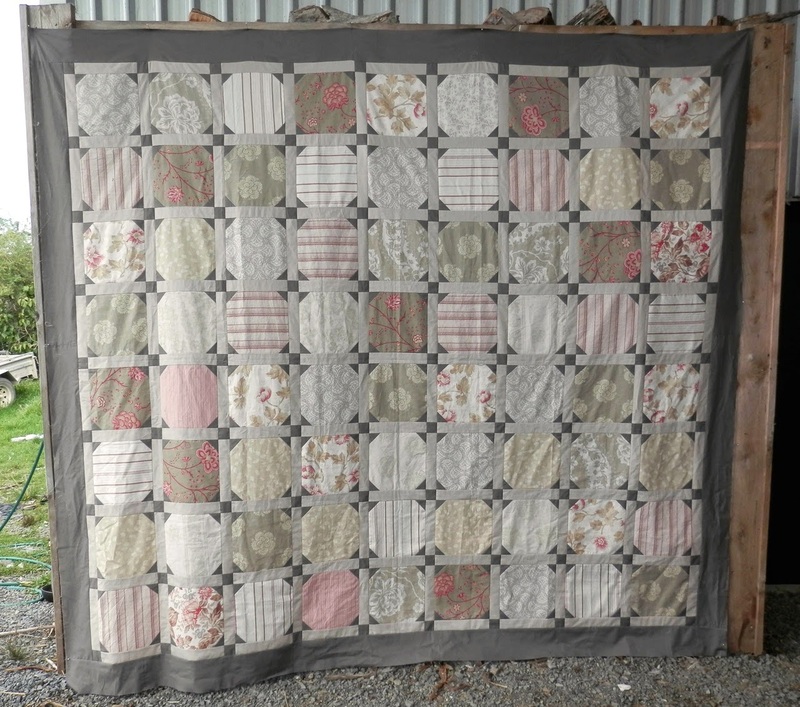 So let me know whether you think this technique is a keeper or whether I should chop it up for a quilt! And here's your next vote. 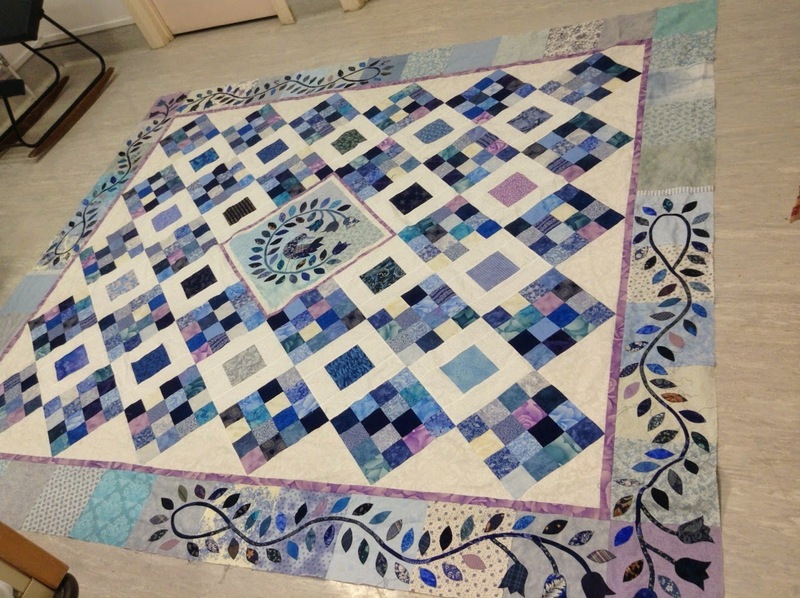 Above is The Big Blue and White Quilt. Below is Creme Brûlée. Which one should I baste and quilt next? 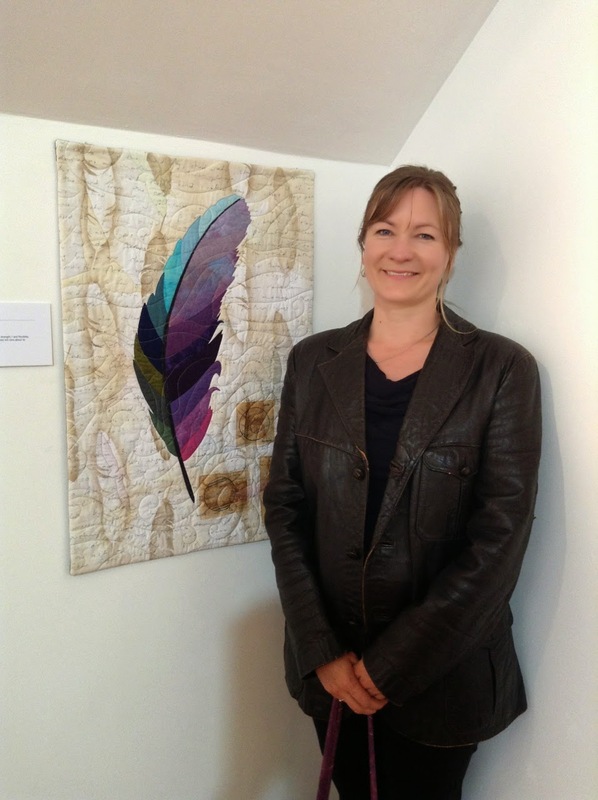 Jaye from Artquiltmaker blog and her podcast with Sandy about Graduation. You can listen here on Podbean. Or subscribe to my podcast on iTunes here. And ..... May the Fourth be with you! The opening of the Dorothy Collard Challenge Exhibition happened at Lake House Arts Centre in Takapuna, Auckland on Tuesday - April 29th. I made it down for the official opening and prize giving. 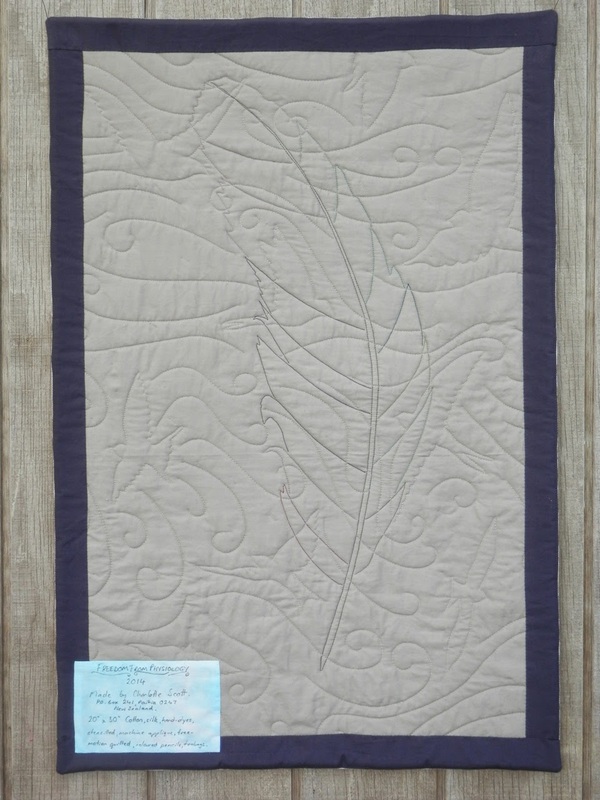 No, I didn't win a prize - but I sold my quilt, 'Freedom from Physiology' so I'm one happy lady! Seeing as I probably won't ever see it again, I thought I'd share the process of making it. The theme was 'The Space Between' and I contemplated lots of ideas before I decided to look at the spaces between the barbules of feathers. There was a size requirement (20 inches by 30 inches portrait) so I cut my white fabric about four inches bigger both ways than needed so I'd have wiggle room and cropping choice later. 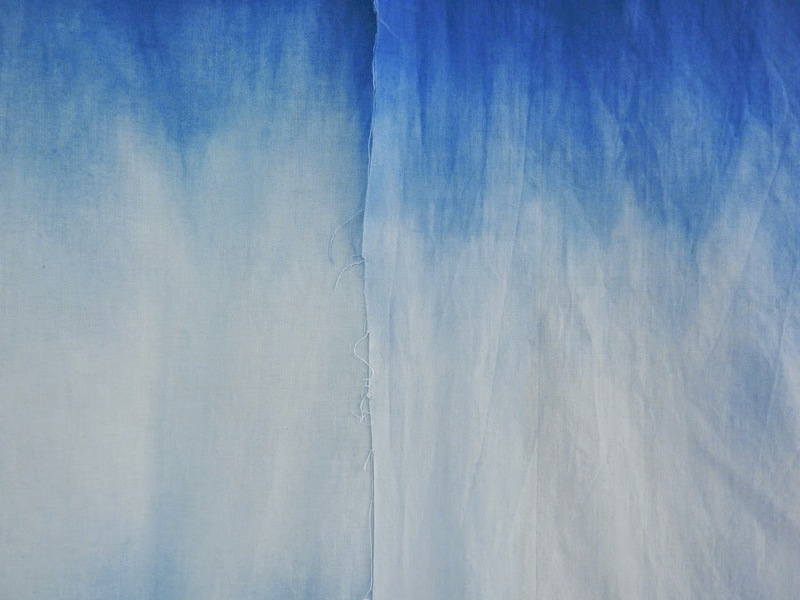 I folded up my fabric and tea dyed it by placing it in a strong tea solution, letting it soak, then letting it dry, ironing it and then washing it out. 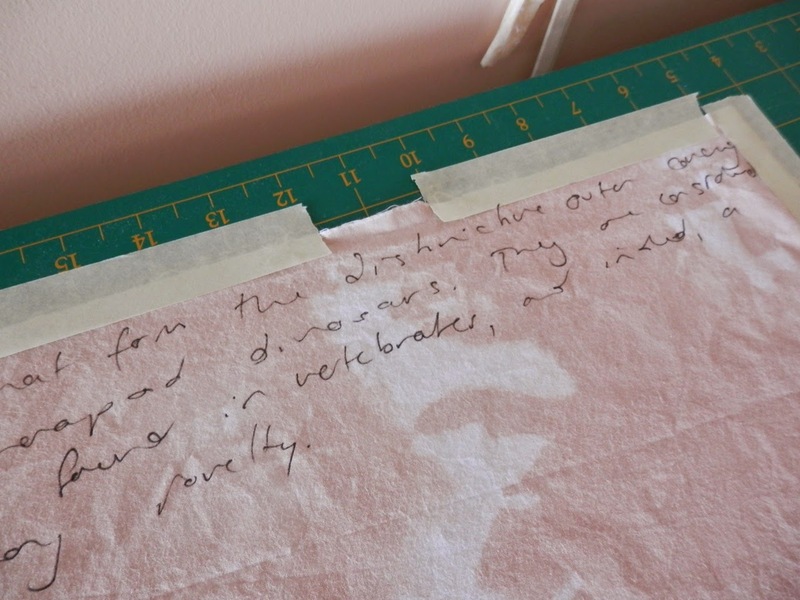 I taped it down to stop it shifting and wrote general information about birds, feathers and flight loosely across the fabric in an archival fabric marker. Then heat set it again. 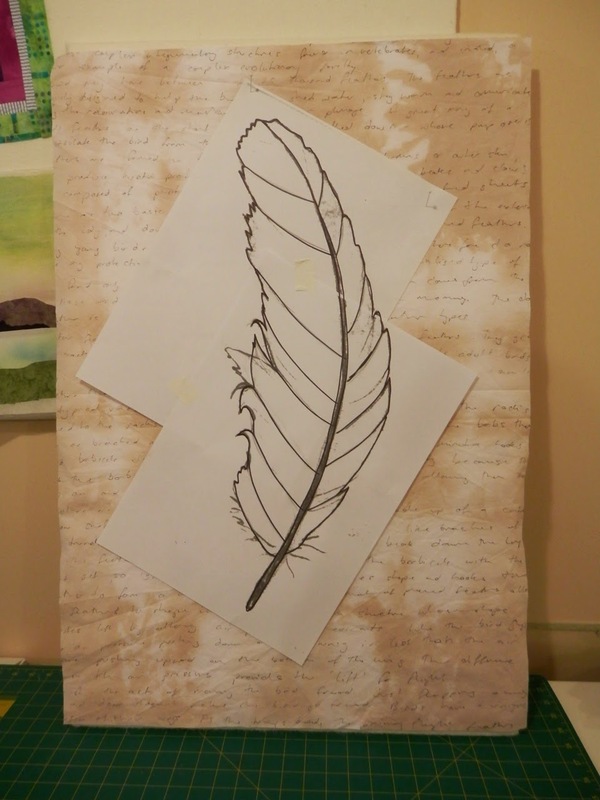 I took a sketch of a feather I had made a couple of years earlier and altered it slightly then enlarged it to fit the size of my piece. I numbered my segments then traced them onto paper-backed fusible webbing. 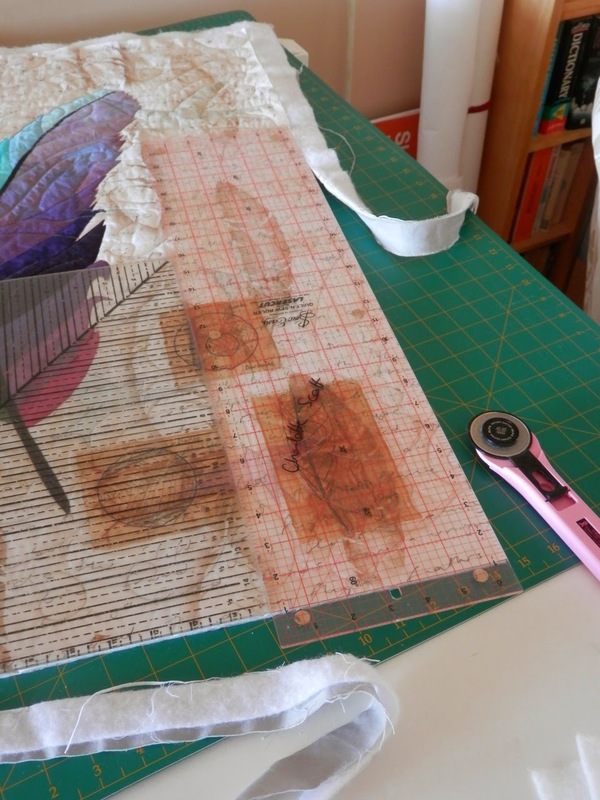 Once I had auditioned and chosen my fabrics, I 'windowed' the fusible web cutouts, ironed them the wrong side of the fabrics and cut them out. 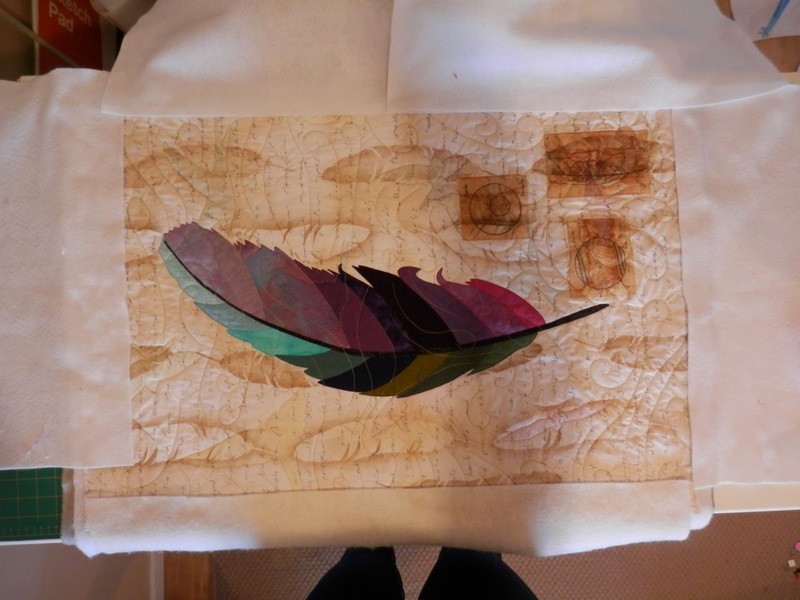 I formed up the feather shape on my non-stick iron sheet first before placing them on my background fabric and raw edge appliquéing them down by machine. This is the step that I missed getting in-process pictures of. 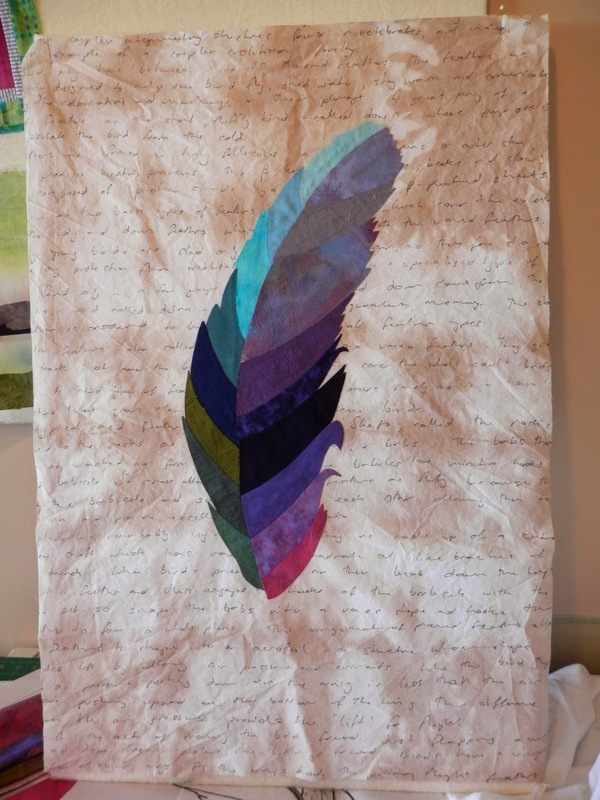 I found the background needed 'more', so I cut out a feather shape from freezer paper and used both the negative and positive image to stencil (using oil paint sticks) the feather onto the background. 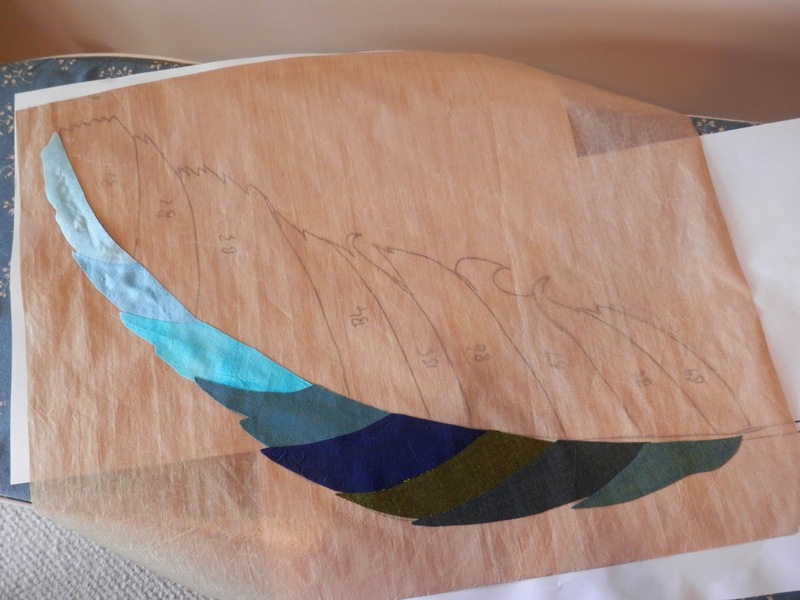 I drew little textbook-like sketches of the closeup anatomy of feathers onto used teabags and then adhered these to the background with fabric medium. You might remember my post on teabag experiments. 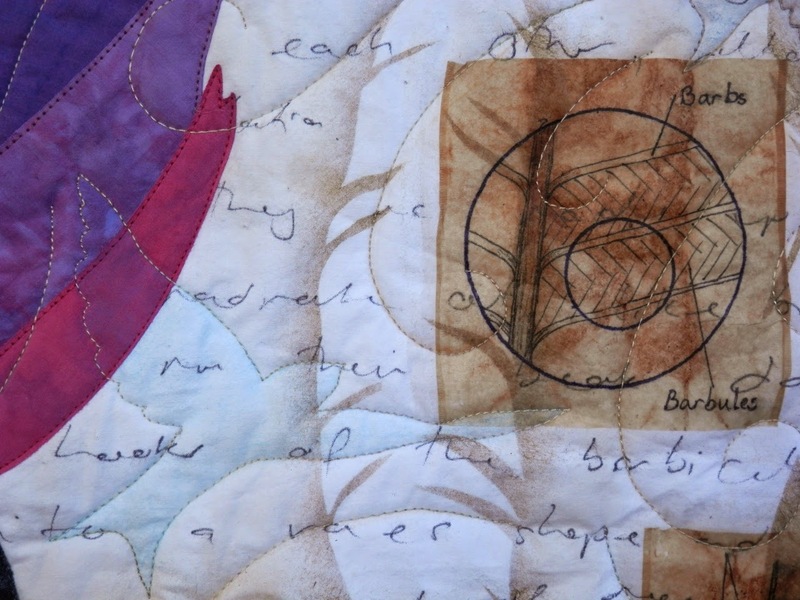 And then it sat on my design wall for fricking ages quite a while whilst I hemmed and hawed about the quilting. It came to me in the end that I wanted to contrast the freedom of flight with the complicated anatomy and physiology that makes it possible. So I quilted flying bird silhouettes, curves and swoops. 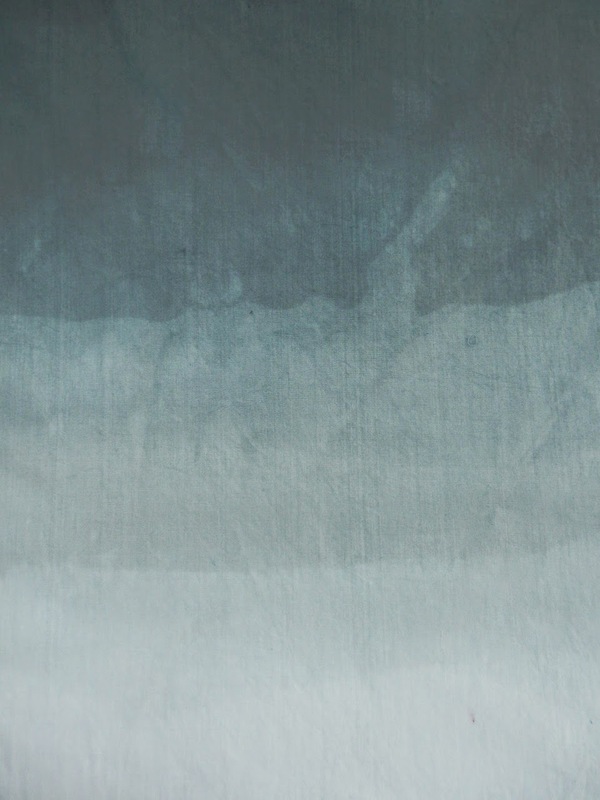 Above is a terrible shot of the cropping process. I take multiple photos of the cropping choices I have to help me decide where to cut. And then I square up and slice. DO NOT slip with your rotary cutter at this point! I used coloured pencils to shade the birds to give them a little more substance and to link them back to the colours of the feather. A photo of the back (because I know there are plenty of back fanatics out there - I'm one of you!). And a picture of the front. I finished it with a facing with non-mitred corners using Susan Brubaker-Knapp's tutorial. 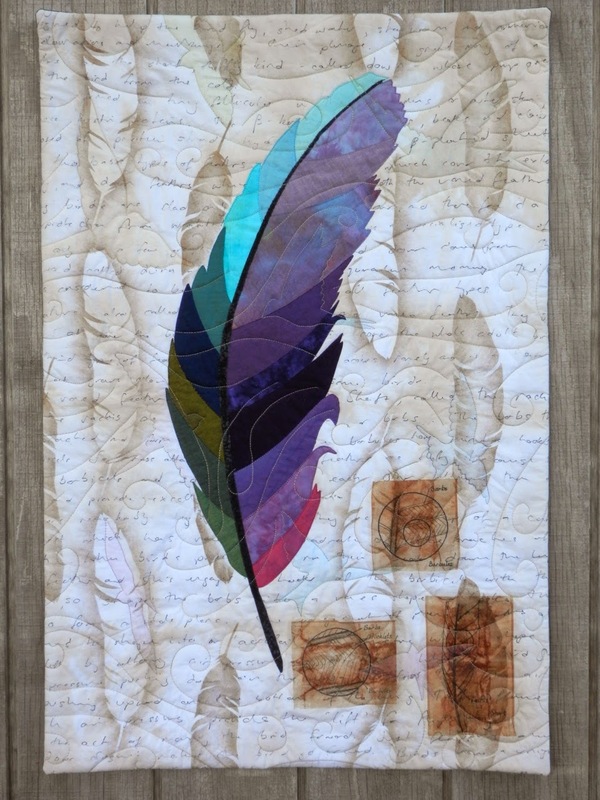 My Artist's statement was: The spaces between the barbules of a feather give the strength, lightness and flexibility necessary for flight. Yet the bird knows none of this, does not care about it's anatomy, just leaps with faith...and soars.